Shipping is an issue that comes up time and time again for companies that are selling online. How much do we charge? How to we calculate shipping? Do we offer free shipping for orders over a certain amount? Do we offer free shipping on the first order only? Do we take a hit on shipping costs in the hope lower (or free) shipping will be the trigger that pushes people over the line? It can get extremely complex, especially when you introduce international or regional shipping in to the equation… i.e. if you charge a set fee for courier deliveries within Ireland, does that include North and South? Does it include the Aran Islands? Usually, flat fees per country work best for everyone involved. They’re easier for users to understand, easier for developers to set up / maintain and easier for businesses to explain / market. 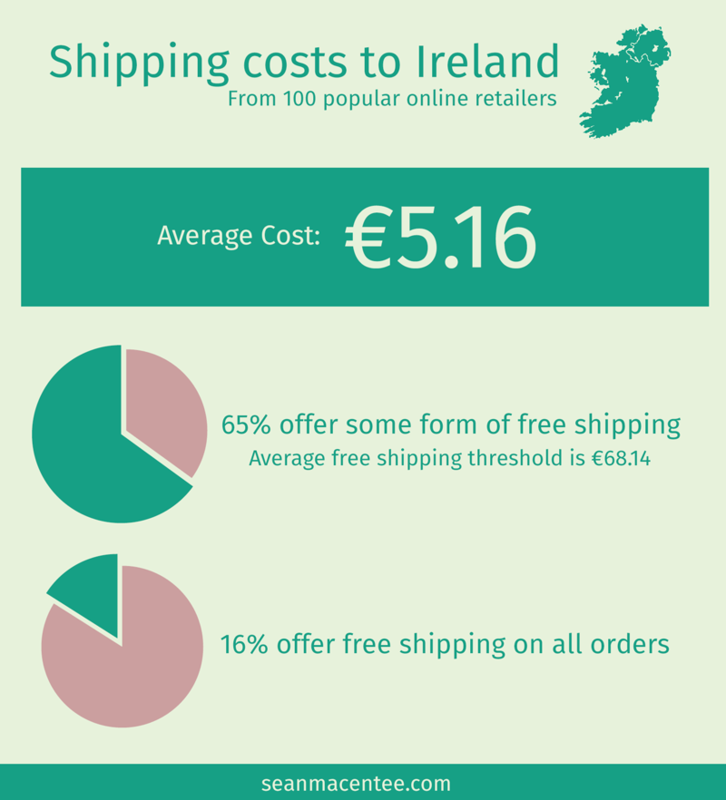 What is the average shipping cost to Ireland from 100 popular online retailers? What percentage of retailers offer free shipping of some description? What is the average threshold for free shipping (if any)? i.e. a lot of retailers will offer free delivery if you spend more than x.